With the weather warming up, golf in full swing and so many great spring events slated for the Pawleys Island area, it's the perfect time to plan a trip to Pawleys Island! If you're looking for first-class accommodations, Litchfield Beach and Golf offers guests everything you could be looking for, from modern one bedroom oceanfront Pawleys Island condos to deluxe six bedroom oceanfront beach houses. 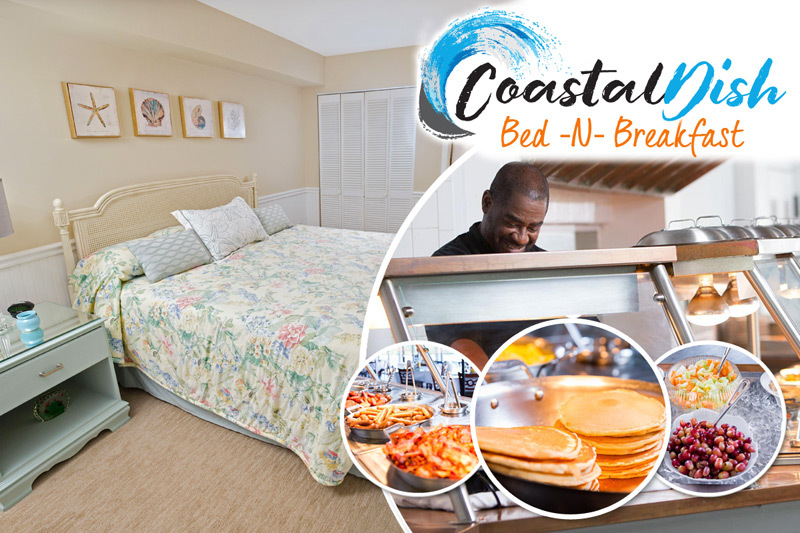 And now when you stay with Litchfield Beach and Golf Resort, you can enjoy mouth-watering breakfast and dinner options at Coastal Dish, the on-site restaurant of the resort. Officially open for the 2018 season, Coastal Dish is sure to satisfy any diner's appetite with a tremendous selection of tantalizing dishes every morning and evening. Each morning of your stay, you can visit Coastal Dish to enjoy fresh-cooked breakfasts featuring made-to-order omelettes, bacon, sausage, grits, oatmeal, fresh fruit and pastries, yogurt and gourmet coffee. After all, with so much fun to be had on your Pawleys Island vacation, a good breakfast is the perfect way to set up your day! Breakfast is served at the restaurant seven days a week from 6:30 AM to 10:30 AM. After a round of golf, a day out on the beach or a shopping excursion, you're sure to have worked up a healthy hunger. Luckily from 4 PM to 10 PM, dinner is served at Coastal Dish! Visit the restaurant and peruse their extensive menu, crafted by their expert chefs and showcasing lowcountry favorites that are sure to impress. Start your meal with one of their delectable appetizers like chicken-fried bacon with pepper gravy, pimento cheese stuffed jalapenos, crab and artichoke dip with toast points or hushpuppied shrimp. Your culinary trip then heads towards their fantastic array of entree options, with signature dishes like cornmeal crusted local flounder, shrimp and grits, lamb ribs, lowcountry BBQ pork and brisket or blackened swordfish with succotash. You simply cannot go wrong with any of the great dinner choices featured by Coastal Dish! Best of all, the Litchfield Company is offering several spring deals that include vouchers for Coastal Dish to use during your stay! For example, with the Coastal Dish Bed & Breakfast special you can save up to 30% off your accommodations and receive complimentary daily breakfast during your stay. But with these great deals, our Pawleys Island condos will book up fast! Make plans for your spring trip to Pawleys Island today and try Coastal Dish for amazing meals during your vacation!